Recently I saw my friend buying a packet of frozen french fries to fry it using her newly bought air fryer. It tempted me to try french fries at home. The success of my McDonalds Veg Burger recipe & KFC style veg strips recipes made me confident enough to try this most popular, kids favourite french fries recipe too. I googled so many recipes & videos to make a perfect homemade french fries. As I mentioned in my homemade potato chips post, you need to use the right potatoes to get crispy McDonalds style french fries. 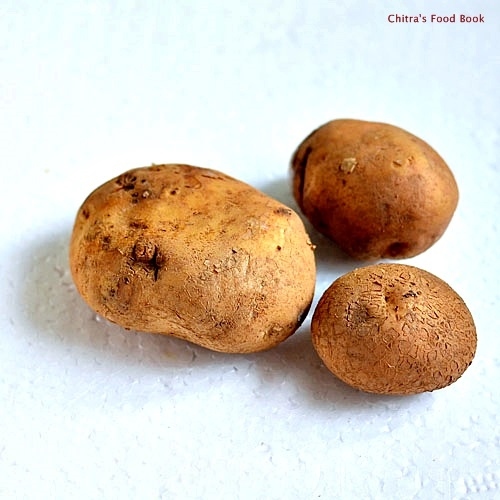 People in abroad can use Russets or baking potatoes. In India, we get red colored potato covered with mud. It is called as chips potato. U have to use that variety for best results. If you have these potatoes in hand,just carry on with this recipe. You can make it perfect as shown in the picture. Here I have just sprinkled salt like in restaurants. U can also season them with organic spices if u wish. And if you are health conscious, you can opt for baked version too.I have given the temperature settings in the method section. When I tasted these fries, I reminded my daughter Raksha. She is in Salem for vacation. She loves these fries a lot and today I missed her very badly. I should make it again as soon as she come here. 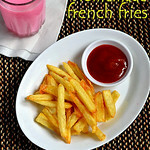 Ok,Lets see how to make crispy,homemade french fries recipe with the picture of potato I used. 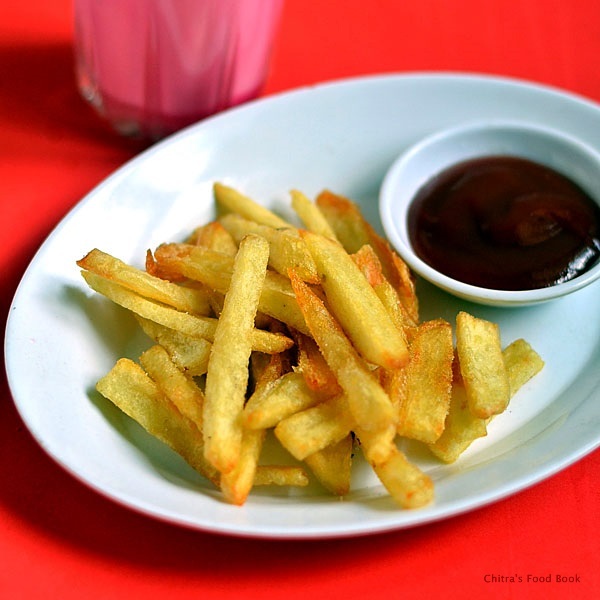 How to make crispy french fries at home easily using 3 methods. Wash and peel the skin of potatoes.Cut them into 1/2 inch thick slices and then into thin strips of uniform size. Wash the strips in plain water or ice water for 2 –3 times to remove the excess starch content. Boil 2 cups of water in a pan. Switch off the flame and soak the potato strips in it for 5 minutes. No need to cover the bowl. Drain the water completely. Pat it dry in a clean kitchen towel. Leave it open for 5 minutes.Make sure there is no water in the strips and it should be completely dry. 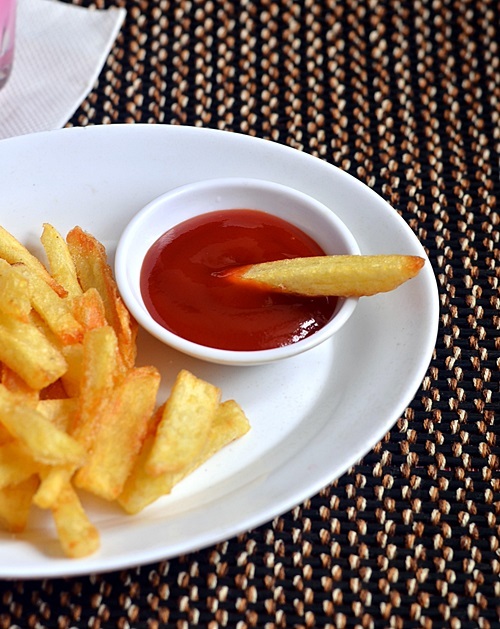 Heat oil till medium hot and deep fry the potato strips for 2 minutes in medium flame.It would be oily and soft.Make sure the colour of potatoes are white.Remove & drain them in a tissue paper. Let it cool down completely.Store in zip lock bags and freeze them for later use. If making immediately,follow the next step. Again heat oil till its well heated but not smoky.Now deep fry the potato strips for the second time till it becomes crispy and golden.Keep tossing them for uniform cooking.Remove in a tissue and sprinkle some salt.Serve with tomato sauce. NOTE : If u want to make them in bulk and store it for later use,after frying for the first time,remove and cool down completely.Store them in a zip lock cover and freeze it till use.Whenever u want to make it,heat oil well and deep fry them.Oil may sizzle & splutter as the potatoes are frozen and coated with ice.So fry them carefully till golden and crispy and serve hot. Baked version : Follow the same steps till u pat dry the potato strips in kitchen towel.Preheat the oven in convection mode at 200c.No need to cook the potatoes.Arrange the strips in a baking plate and drizzle some oil all over them.Sprinkle some salt or organic seasoning. Bake them at 200c for 25-30 minutes OR till they become crispy.Remove and serve hot.Soon,i will try to make a separate post for this baked version. Follow any of the above discussed methods based on your liking.You will get crispy french fries. 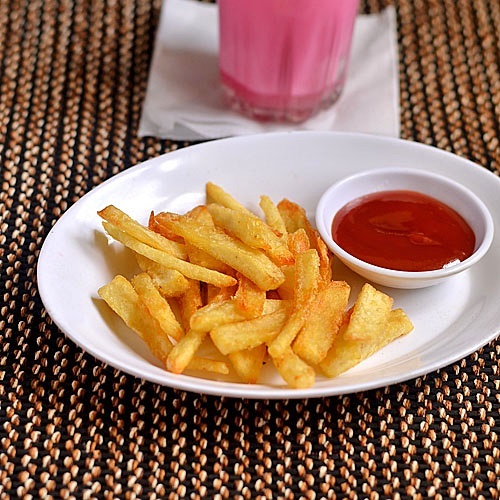 To make these fries more flavourful,u can sprinkle garlic powder,thyme,basil etc. Use Red colored mud coated potatoes for best results.Other potatoes may turn brown quickly while roasting. Washing the potatoes twice is to remove the extra starch content in the potatoes.It helps u get nice color to the fries. 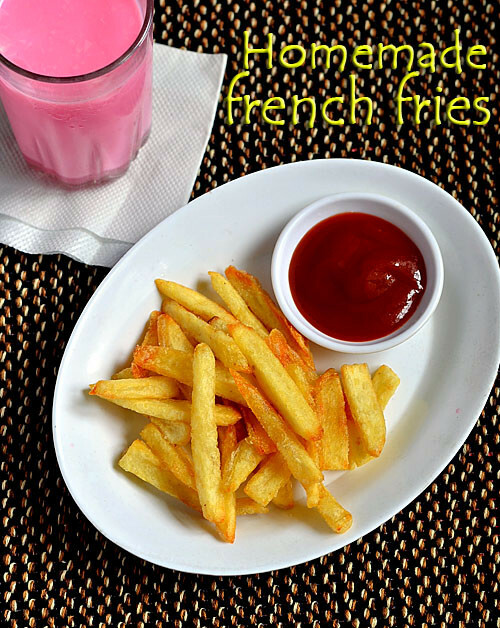 Try these awesome,crispy french fries at home for your kids.They will love it for sure.!! Nice.. My all time favourite... :) one small tip which i got from a blog. After you cut and wash, boil water with salt and soak the potato for 5 mins, pat it dry and follow the same steps. you will get uniform color :) I have tried and worked for me. Preheat the oven for how many minutes? And bake it for 25 - 30 minutes at what temperature? Hello, Its mentioned in the post. preheat & bake at 200c. Preheating is built-in in most of the oven.If not, preheat for 3 minutes.